Price: $2,625.00 Pricing Options Below - See Dropdown MenusThis incredible castle bunk bed is designed for 2 twin mattresses. Entry to the loft is through and up the "window tower". The other tower houses shelves behind a door. The photo shown here is an "undersea theme" but can be designed in a more traditional theme using custom colors (call for custom designs). Imaginations will run wild providing entertainment and enjoyment for years. 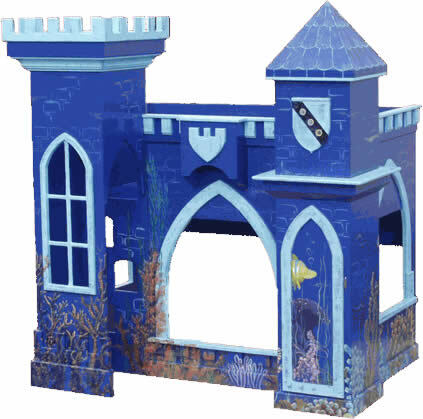 Full Description This incredible castle bunk bed is designed for 2 twin mattresses. Entry to the loft is through and up the "window tower". The other tower houses shelves behind a door. The photo shown here is an "undersea theme" but can be designed in a more traditional theme using custom colors (call for custom designs). Imaginations will run wild providing entertainment and enjoyment for years.